Coach Eric Taylor is the newest hire at a small town high school in Dillon, Texas. After a series of events leading to his release, Taylor is forced to build a football team from the ground up at the rival high school. His wife Tami, high school principal, faces scrutiny of her own as she takes constant blame from angry parents. But even through the hardships at work, challenges at home with teen daughter Julie, and endless drama, only one thing matters: Friday night. 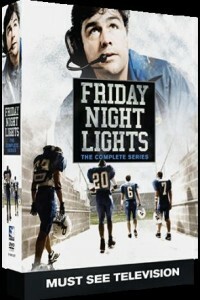 Through five extraordinary seasons, the residents of Dillon, Texas, kept viewers captivated with the small-town struggles, victories, and heartbreaks that resonated across America with breathtaking realness, and made Friday Night Lights, a Primetime Emmy® award-winning drama. Relive the spirit of this small town with a big heart: from the pride and pitfalls of high school football to the intimate relationships between lovers, parents and friends.